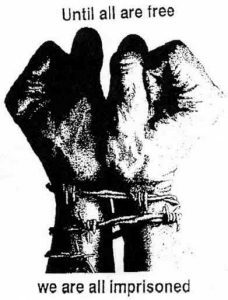 International Solidarity Week of Anarchist Prisoners: Some anarchists in Sydney visited the Indonesian consulate in Maroubra on Thursday the 23rd of August. 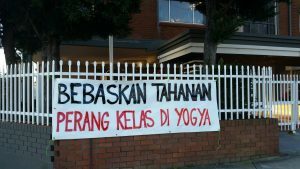 A banner is tied to the fence around the consulate reading: “Bebaskan Tahanan Perang Kelas di Yogya” (Freedom for class war prisoners in Yogyakarta). 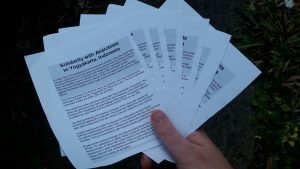 Dozens of leaflets were also distributed and scattered outside the embassy. Anarchists in Yogyakarta has faced a wave of repression following the 2018 May Day demonstration, which saw flaming barricades in the streets, a police post torched and a call for the local Sultan to be killed. demonstration and number of them are still in prison facing trail. 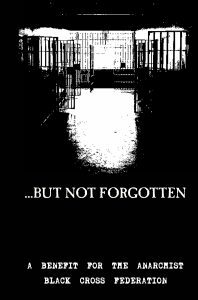 This entry was posted in Solidaritas and tagged #tillallarefree #news #anarchistprisoners #solidarity #abolishtheprison. Bookmark the permalink. Both comments and trackbacks are currently closed.